I loved seeing Etosha under massive clouds most of the days during our recent trip. Most people tend to go in winter time and then it's mostly hazy blue sky you see in their images. This place truly is big sky country with an immense sense of space! 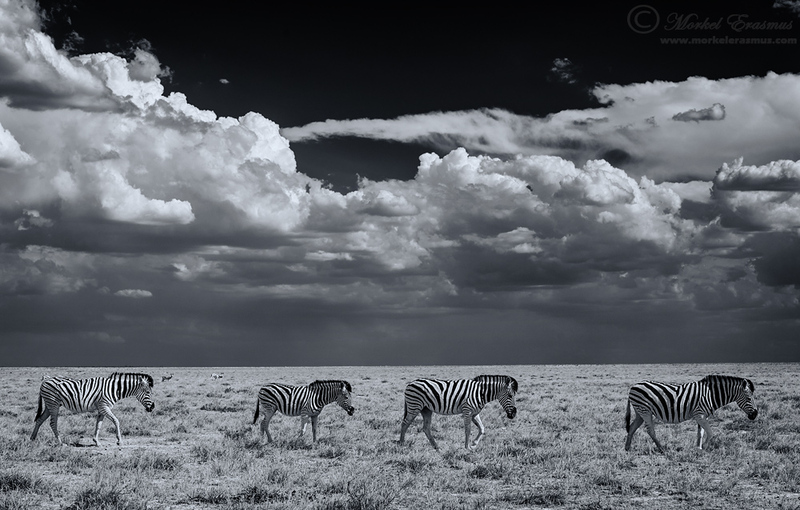 This lineup of Plains Zebra were walking along the plains en route to the Salvadora waterhole in the Halali region. I went for a monochrome conversion here, giving it a slight blue tone. Zebras just work so well in a colourless format, and the use of the circular polariser on the lens lends that deep punch to the blue sky which also converts well if you apply a red filter in the conversion process. I used Nik Silver Efex Pro for this quick conversion, though I often play around more with it afterwards in Photoshop to use more dodging and burning. I hope to find more time to process some new images over the weekend. Let me know what you think of this one in the meantime.